﻿ AOM AV1 Codec vs HEVC/H.265, Will AV1 Dominate in 4K/8K Processing? HEVC (or H.265) that caused a big stir in the industry last year is expected to be the codec of choice. With the arrival of AV1, however, things are likely to change - it seems that AV1 is going to replace HEVC and becomes the future codec for 4K Ultra HD/8K video processing within two years. FFmpeg 4.0, the latest version released on April 20, has jumped on board with support for AV1 video decoding through libaom, and VLC 3.0 also added experimental AV1 video decoder support. Bitmovin tested the MPEG-DASH/HLS playback of AV1 in Firefox Nightly by ensuring encoder and decoder use the same bitstream version, proving that the new coding format is 25%-35% more efficient than HEVC and VP9. What is AV1 codec? AOM AV1 versus HEVC/H.265, which format makes better results? AVI, short for AOMedia Video 1, is an open video coding format developed by AOMedia (Alliance for Open Media). AV1 is designed to take place VP9 and beat HEVC (H.265) down. Look at these four keywords related to the new format - open, fast, royalty-free, and ultra-high definition. Now you should get a general understanding of AV1 codec. It targets UHD video encoding compression, including support for wider color gamuts and higher frame rates, and provides a practical algorithm for WebRTC. For more info, you can check our previous post "what is AV1 codec". Now, let's dive deep into AV1 vs HEVC (H.265) comparison. According to a recent MSU codec comparison report, AV1 is currently the highest quality video coding format. Based on the YUV-SSIM quality metrics, AV1 offers the same quality at more than 12% less data rate than x265 does running in three-pass Placebo mode. 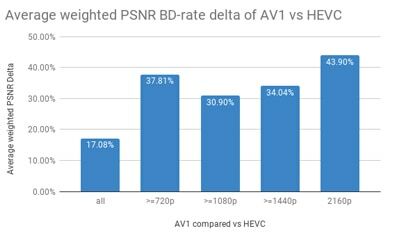 Bitmovin's research also shows that AV1 video quality is superior to HEVC and VP9 at the same bitrate settings. 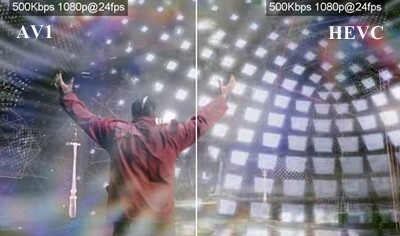 The test used 1080p videos at 500kbps and 24fps on the PSNR and VMAF metrics. Codec version may influence the AV1 and HEVC quality comparison result. AV1 aims to be 30% more efficient than HEVC and VP9. Tests performed on a wide range of bitrate and resolutions demonstrate that the average bitrate of AV1 is reduced by 17%, compared to HEVC/H.265. When it comes to 4K Ultra HD 2160p video, AV1 outperforms HEVC up to 43.90%, compared to 720p of 37.81%. More results are shown in the following HEVC and AV1 dataset pictures from Bitmovin. Facebook shows that AV1 encoder is roughly bitrate reduction of 40% compared to VP9 and up to 50% while compared to H.264 (x264). That also means AV1 codec cuts down bandwidth demands and compresses 8K/4K file size by up to 30%. Compare AV1 and HEVC/H.265, the newer format loses in terms of speed. Studies suggest that AV1 encoder is extremely slow - "2500-3000 times lower than competitors". At 2018 NAB Show, AOM developers told AV1 was about 50-200 times slower than HEVC and VP9. Currently, it takes nearly 100 seconds to encode a single 4K frame. The later development focuses on AV1 encoding speed. Considering its deadly slow speed, it still takes a long way to go to be in wide use. People also search for: H.265 vs H.264, VP9 vs H.265, H.265 hardware encoder. Nvidia: GM206 GPUs (GeForce GTX 960/950) and newer, GeForce GTX 900 series, Tegra X1 SoCs or newer. Intel: 6th-generation 'Skylake' Core processors or newe. AMD: 'Fiji' GPUs (Radeon R9 Fury/Fury X/Nano) or newer, 6th-generation 'Carizzo' APUs or newer. Apple A10 processor and newer. Qualcomm Snapdragon 805/615/410/208 SoCs or newer. In a comparison of AV1 against HEVC, AV1 decode complexity is lower than HEVC decode but it's performed by CPU. What's more, AV1 video encode algorithms are more advanced, thus it requires more powerful hardware. Early demos show that nearly 200 virtual CPU cores are required to encode and stream one AV1 video channel. Rumors suggest AV1 hardware decoder and encoder will be available in mid-2019. Since there are a group of hardware members like Intel, AMD, Invida in AOmedia, it's just a matter of time to see AV1 hardware accelerated encoding support on the GPU. 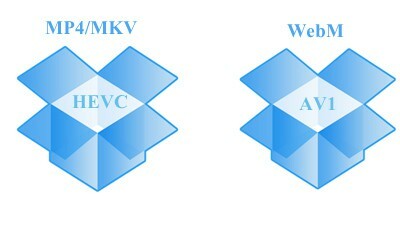 HEVC commonly uses MPEG MP4 and MKV container format. MP4, the universally accepted container, won't be selected as the container format for AV1. AV1 will probably use WebM developed by Google, a high-quality and open video format for HTML5 web video and WebRTC. WebM is also the container for VP9 and VP8. WebM and AV1 format are extended from VP9 and have the same design goals, they are open, free, and Ultra-High quality. Apple brought HEVC and HEIF compatibility for iOS 11 and macOS High Sierra last year. HEVC is widely accepted by newer-generation devices, hardware, software and operating systems. And users can choose to convert HEVC to H.264 if they run into compatibility issues. We won't see much AV1 compatibility problems once it's put into use. We can see tons of big names from the list of founding members of AOMedia, ranging from hardware giants AMD, Intel, Nvidia to Brower leaders like Google, Firefox, Microsoft, from streaming service providers YouTube, Netflix, Prime to Adobe, Apple. HEVC (H.265) is developed to process 2K/4K/8K ultra HD videos and 3D video processing more efficiently, which doubles the compression ratio at the same quality, compared to H.264. Now, 4K monitors, Ultra HD 4K/8K TVs, good hardware and software all include HEVC/H.265 codec. Compare AV1 and HEVC, AV1 is the future 4K codec format for the web, which is 30-40% more bandwidth efficient than HEVC and VP9. YouTube and Netflix will start using AV1 for much faster 4K/8K video and VR content streaming. AV1 or HEVC? Which Is the Future Codec? AV1 vs HEVC/H.265, AOM AV1 coding format is 30% to 50% more efficient. 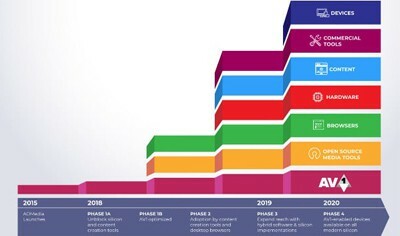 Moreover, different from HEVC that requires hardware manufacturers to pay license fees, AV1 is open and royalty free. The new codec format for 4K/8K Ultra High definition seems to have a bright feature. With Apple, YouTube, Netflix, Google, Adobe, AMD, Intel, Nivida etc. giants joining in AOMedia, the creator of AV1 coding format, AV1 will witness rapid adoption and hardware support. AV1 is able to potentially replace HEVC/H.265 and VP9 and dominate in 4K UHD content processing. Video Processing: Transcoding 4K Codec HEVC VP9 etc. MacX Video Converter Pro will be among the first group of video processing tools to be able to encode and decode AV1 videos. Currently, it fully supports HEVC (H.265), other modern 4K codecs conversion at up to 5x faster speed than Handbrake and other competitors thanks to Intel/AMD/Nvidia hardware acceleration. 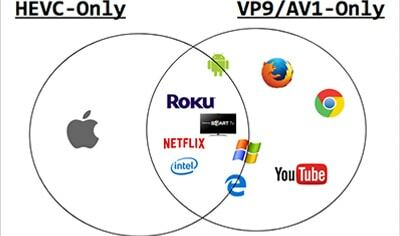 WebM vs MP4, Is WebM the Best Container for AV1? What's the Best Codec for Video Quality and Compression? What Is 8K, Is AV1 the Best Format for 8K? Will AV1 Change 4K Video File Size? 4K video size is huge. AV1 may change the situation. Get to know where to find 4K content to watch. 4K vs 8K vs 10K, which resolution will donimate? Read full guide to reduce video file size with high quality.